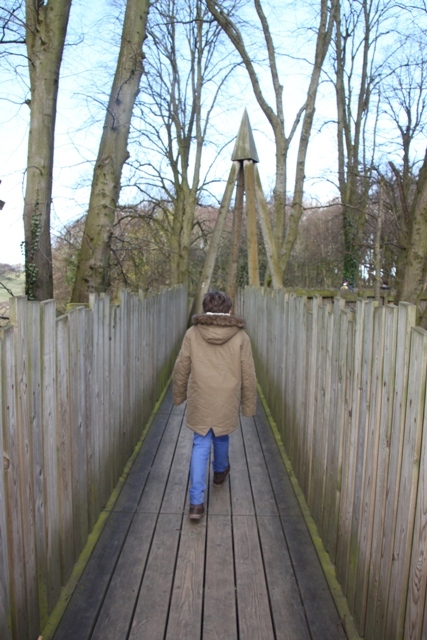 Having explored Alnwick Castle and immersed ourselves in all things Potter the castle gardens were next up. A bit of a shock to have to buy another separate ticket – this makes it a super expensive experience, but we didn’t want to come all this way and miss out. The (free) public park / walk linking the castle to the gardens is almost as impressive as the gardens themselves. 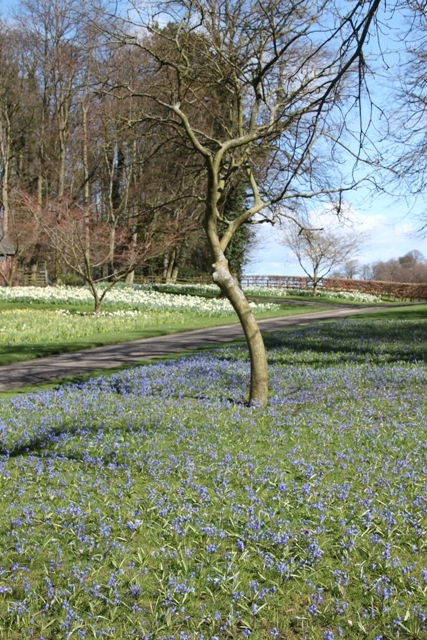 Designed by Capability Brown we were greeted by more than a host of golden daffodils. The whole place was ablaze with gorgeous spring flowers and the most stunning views back to the castle. Definitely worth coming out here, even if a garden visit is not on your agenda. The gardens are modern, different and impressive. There are 14 acres to explore, this was a project started by the current Duchess in 1995. Not your traditional castle garden, here things are comtemporary and rather refreshing. We entered through the lovely pavilion and visitor’s centre – all glass and pale wood and so very airy. Son made a beeline for the Lindt chocolate trail – a treasure hunt around the gardens with a chocolate bunny reward at the end. Horticulture not topping his favourites list, this was win-win – he insisted on exploring every nook and cranny in search of clues and answers, we got to see everything without having to listen to (much) groaning and a chocolate bunny was devoured at the finish. Water is a big theme in these gardens – and for a change on this trip it didn’t involve rain. 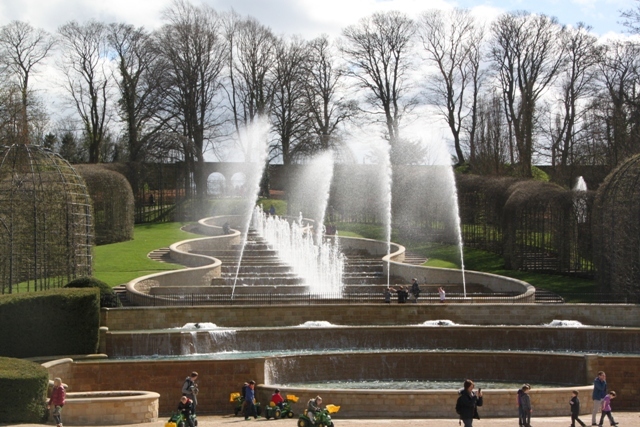 As we left the pavilion we were greeted by the wonderful grand cascade – modern, terraced fountains with gallons of water tumbling down the hill. It is spectacular and mesmerising. 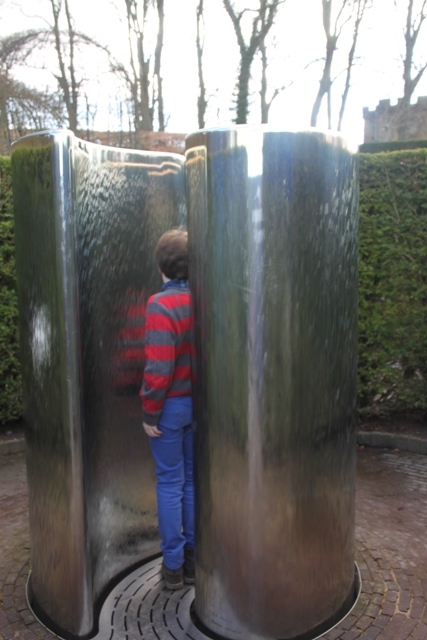 The eight water sculptures near the fountains were a hit with Son – he had to be dragged away. All different these include a vortex and a sculpture that has 16 feet tall stainless steel columns that fill with water and spill over the sides. Great fun to watch, great fun for kids to get close but be prepared for soggy clothes. 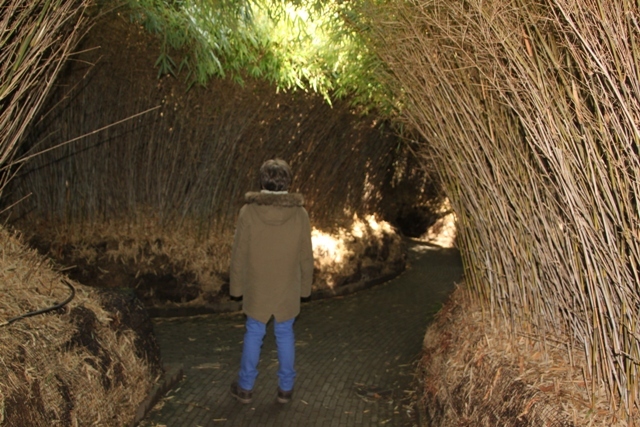 The towering bamboo labyrinth is a maze of 500 bamboo plants and pretty cool to walk through. 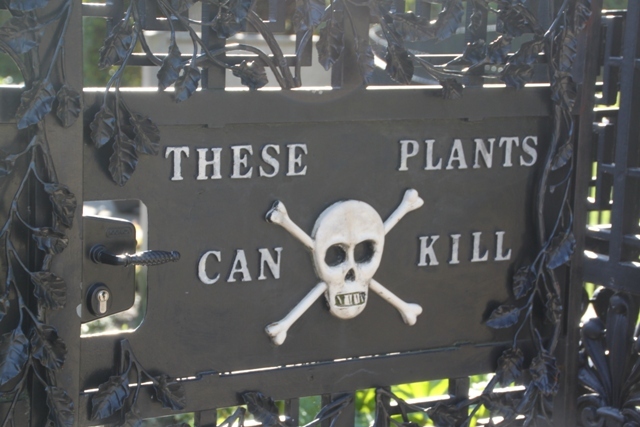 My highlight was the Poison Garden – a bit spooky in appearance and fenced off to add to the allure. You have to take a guided tour (these run about every 15 minutes and don’t need to be booked) and our droll and funny guide pointed out lots of toxic plants and delivered fascinating facts. Amongst other things we saw cannabis and opium poppies, it was unmissable. 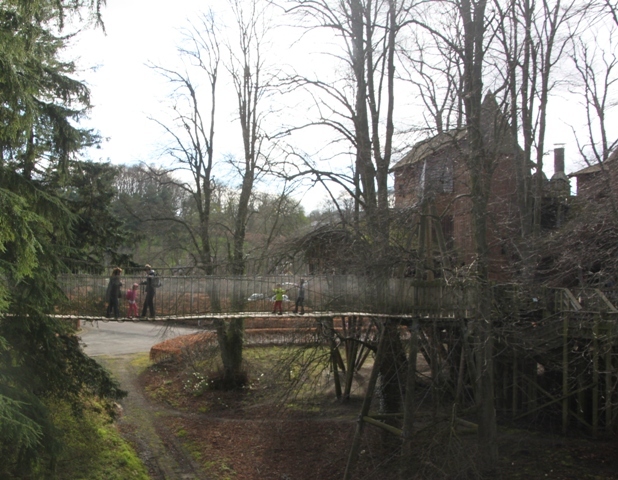 Son was keen to get to the treehouse after all that poison talk – actually the main reason for our visit. 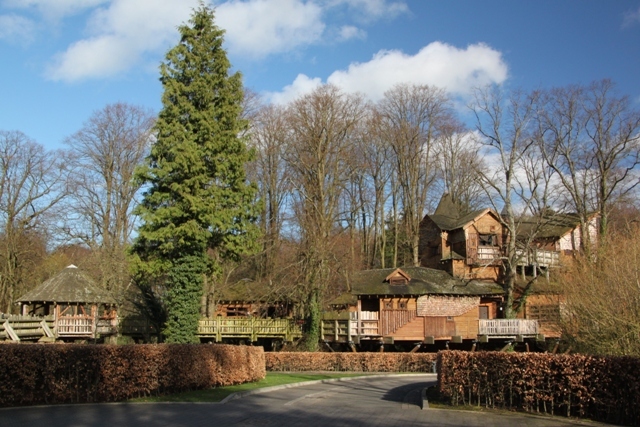 You don’t need to buy a ticket for the gardens if you just want the treehouse – it sits outside. It is built amid 17 lime trees and there are thousands of feet of walkways, hanging platforms, balconies, wobbly rope bridges and spiral staircases between the different levels. Great fun for kids and adults we had a whale of a time exploring the different areas. There is a restaurant (which we didn’t try) and a coffee shop (which we did). After refreshments in the latter establishment – the treehouse theme continues here – we headed out for more larking about. 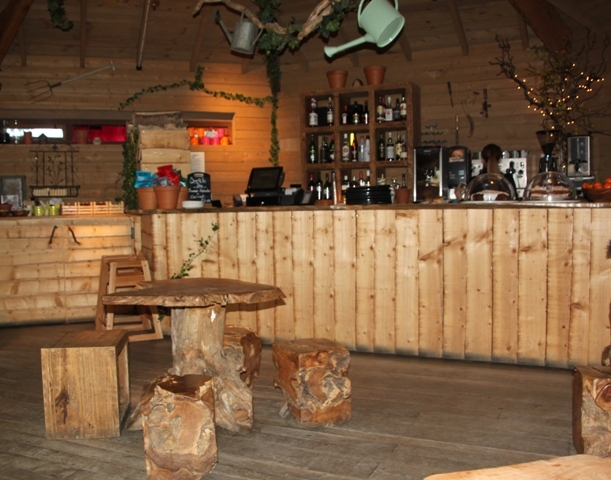 The treehouse is special – it felt as if we had gone straight up the Magic Faraway Tree. A great place to end the day at Alnwick. Been to one castle so far on our trip to England (Rockingham) but have been so impressed with all the gardens I have seen so far here. Even the botanical gardens back in my home town are haphazard and unkempt compared to the ones here. Never been to Rockingham Castle – look forward to reading about it? 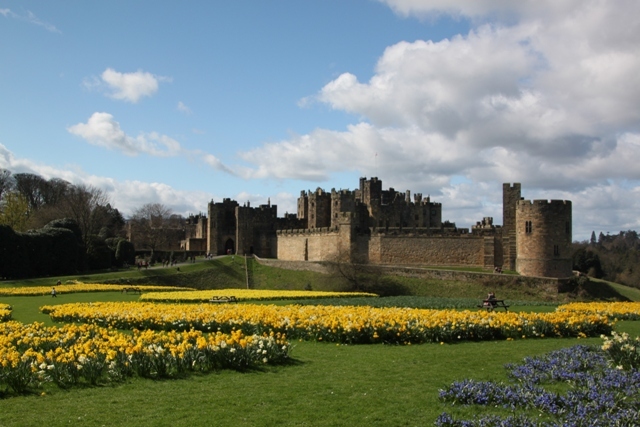 Alnwick is wonderful we loved it there and the gardens were stunning. Hope you are enjoying England! Beautiful gardens, thanks for sharing!! They are stunning, something for everyone too! 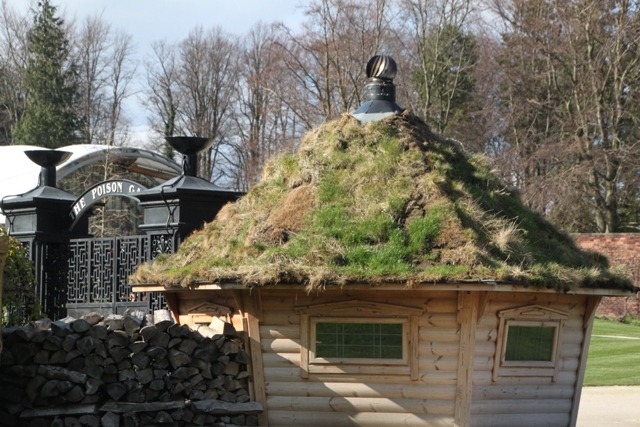 It’s a bit different to other gardens we’ve visited – so much to see and something for everyone. The garden, fountains, and tree house all look wonderful. I’ve never ventured that far North in England. There’s just too much to see, do, and of course never enough time when visiting your country. I’m longing to return. This is a beautiful county to visit when you return – we don’t know it very well either but were surprised and delighted by this trip – we want to go back too! That garden looks extraordinary. It’s interesting and, like you say, refreshing, when someone decides to create something of it’s time instead of just trying to replicate the past. I especially like the look of the water sculptures. I think she got a lot of flak from a lot of people about the design but we loved it. 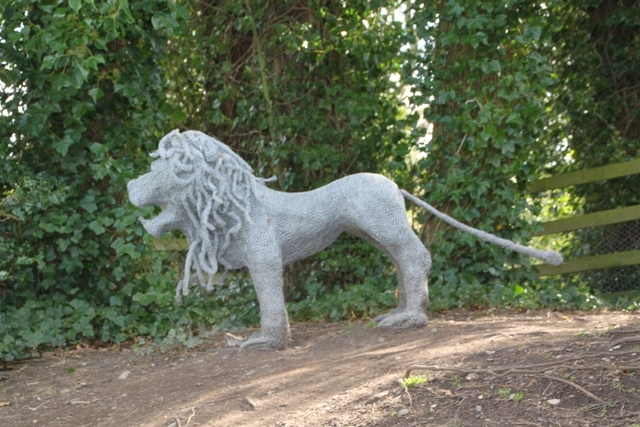 Like you say it’s good to do something different and this definitely is, we loved the gardens and the water features! 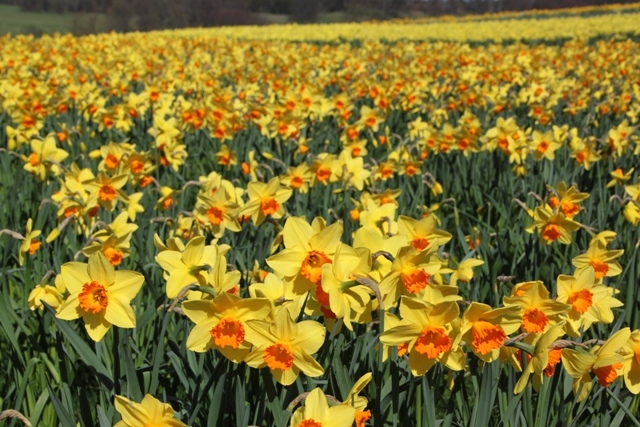 Daffodils are my favourites – but these here were just stunning and so many everywhere! 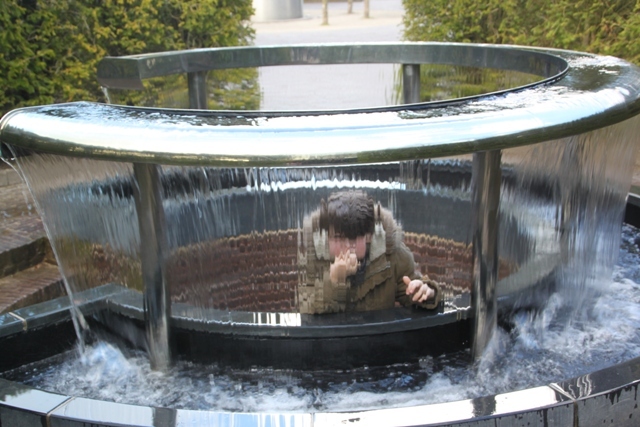 It was just gorgeous – the fountains were a big hit with our son, he could easily have stayed there all day. Those flowers are stunning – great time of year to visit. Beautiful photo of the daffodils. Thank you for checking out my blog. I love reading about other families traveling with kids. These gardens look like quite an adventure. The fountains remind me of a trip we took to Peterhof Palace before kids. Thank you for sharing. I look forward to reading more. Thank you for coming by here! Enjoying reading about your adventures in Japan – sounds amazing.